Love this video. Yes, That’s My King! And that is who we are celebrating at this time of year. It’s about what I get or give. It’s not about Santa or elves. The reason that I celebrate Christmas is because a Man was born. Long ago. In stable. And He lived an example for me and then died. But He rose again. For you and for me. Are your words as persuasive as they could be? Often times, especially in web design, the content comes last. An after thought. This video, however, powerfully illustrates how different words, can make the message even more powerful. 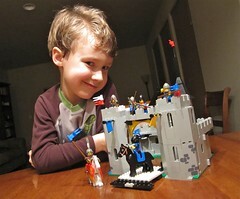 The one set that I still have from my childhood is a smallish castle set. It has turret, a draw bridge and a small collection of Knights. There are a few missing pieces but nothing that prevents it from being built. I have built it several times over the years, but every time for me it has been something that consumes all my focus till it is done. My goal is to finish it. To get it built. Yet recently, Kyle has taken to building it himself. In fact, today he just finished it for the second time. Yet it has taken him at least 4 days to do it. No, that’s not 4 days straight. He does it on and off a few minutes here, a few minutes there. He seems in no particular hurry to get it done. Many times he will even totally ignore the project and opt for something else. On Friday, after he had finished the first section of wall, all the knights and horses showed up. They were standing on the wall, resting in it’s shade and acting out little scenes. They even fought off a few invaders. As the wall progressed, through each step of the way, the soldiers and knights inspected and moved into each new section. For awhile it annoyed me that he couldn’t focus on it long enough to ‘get it done’. But then I was struck by his wisdom. Did he care that it got done? Sure he did. He just finished it today and was so excited and proud. But he wasn’t rushed to get it done. He was enjoying each step of the way. He knows his limits. He knows he can’t get it done in one day, so why rush it. As I’ve reflected on this over the new years holiday, I realized that I need to take more time to enjoy the journey. Because once it’s over, it’s over. But the joy comes along the way. Too often I focus on getting something done. “Got to get this done.” “I need to see this accomplished.” “I can’t wait till…” But how often do I enjoy the little steps along the way? As you began this year, take some time to think about where you are going but don’t forget to enjoy the path that you choose to take. Because it’s along those paths, that some of life’s greatest joys are found. Another great short, this one by Peter Naylor. I love it when a story can be told without a single word spoken. ENDEAVOUR from Peter Naylor on Vimeo. Recently I have run across some excellent films, thanks in no small part to Twitter. A film by Andrew Wonder that follows Steve Duncan, a urban historian and photographer, though some of the underground treasures of New York City. The film is 30 minutes long but is absolutely gripping once you get started. Images are gorgeous and it was shot entirely on a Canon 5d Mk II with one lens, a 24mm Canon L lens. Enjoy the full video after the break. NOTE: There is some strong language at times. I have never been a big fan of cake for my birthday. As a child, my mom always let me choose what I wanted and usually it was some kind of pie. Or crepes. But I have finally found a cake I can savor and look forward to: Gingerbread cake with hot Lemon Sauce! This has become my requested desert of choice! This version of the cake is gluten-free, a must for any sweets in our house! 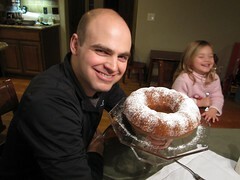 While it’s good when the cake is hot or cold, it’s best when the cake is still warm and the sauce is nice and hot! Preheat oven to 350F. Cream margarine and sugar, add molasses, continuing to mix. Next add all remaining wet ingredients and blend until smooth. Finally add all dry ingredients and blend till smooth. Spray with vegetable oil spray before pouring the batter into bunt pan. Bake at 350F for about 40 minutes. Let cake cool before carefully removing from pan. Finish it off by dusting with powdered suger. In large saucepan, stir together sugar, cornstarch, salt and nutmeg. Gradually stir in boiling water, then simmer over low heat until thick, stirring occasionally. Remove from heat; stir in butter, lemon zest and lemon juice and serve. 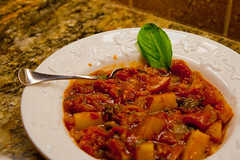 One of our favorite restaurants in Spokane continues to be Europa Pizzaria & Bakery, a small european cafÃ© on Wall St. One of the soups they make is a tomato potato basil and that last time we were there, I decided that I was going to figure out how to make that soup. I started by Googling but when I failed to find anything close, I struck out on my own. While this isn’t a direct copy, I think it is close. Their version has more pepper and a bit of a kick, as well as a bit more liquid. SautÃ© diced onion and garlic with the olive oil in a 6 quart sauce pan until the onion is translucent and browning. While the onion is sautÃ©ing, dice the potatoes and add them to the pan. Add the diced tomatoes, basil, salt, oregano and water and let it simmer for 30 mins or until the potatoes are soft. This time I did it with 2 cups and it came out closer to a stew. Combine with cornbread, or our new family favorite, cranberry cornbread, and this is a great supper. Is this what Flash on the mobile is all about?!? There has been a lot of talk recently about Flash on mobile devices, specifically how bad Apple is for not allowing Adobe to develop a Flash player for iOS devices. So Adobe valiently turned the other way and said they would work with Google to develop Flash for Android. There has been much touting of the fact that Android 2.2 now supports Flash 10.1 (via a download from the Android Marketplace). This morning GigaOM’s NewTeeVee site has an aricle and video of the fancy new technology at work. What was their opinion? Hit the NewTeeVee site to view Kevin Tofel demonstration, over WiFi and a 25-Mbps Verizon FiOS broadband connection, and judge for yourself. In Adobe’s defense (yes, I will come to their aid), these videos are not designed specifically for mobile devices. However, that only underscores the face that it is a DREAM to believe that your content can be viewable on a mobile device without you having to do anything to optimize it. Mobile Flash is not a panacea. Recently at work the issue came up that people were searching our site for all the posts by an author but it only returning the author’s biography node. After some digging, I finally found a simple solution thanks to Julia at juliakm.com. The solution was simple and worked exactly as I was hoping it would. All you have to do is add the following code to your custom module (You don’t have a custom site module?). Hopefully you find this helpful. The only drawback to this method is that you will have to trigger a reindex of all the content on the site.